Last summer I dropped the F650 once, and nearly dropped it a couple other times. Someone backed into it in our condo parking lot and pushed it over. Another time, the bike shelter blew over, taking the bike with it, although it didn’t go all the way down. I hadn’t ridden in many years and was essentially a new rider in this respect. There typically isn’t a lot of damage, if any, when it goes down, but any damage is annoying and replacement parts costs are not trivial. I learned not to park the bike where someone might back into it. It has a fairly dark cover and in the wee hours of the morning someone leaving for work might not notice it. I think a lot of seemingly hostile behavior from other drivers is just a matter of not seeing the bike. We are building a small house near the condo and I have the bike shelter there. I anchored the shelter to keep it upright in a blow. I hope to have better accommodations for the bike by this winter. I tend to ride it whenever I can, so I don’t want to put it in deep storage. Which brings me to the subject of me dropping the bike while on it. No one else to blame. When the bike is stopped, or nearly stopped, it is easy to balance it and keep it balanced as long as you pay attention and don’t let it tip too far. The further you tip it the more horizontal force is needed to keep it from falling. At some point, it is too much and the bike goes down. After a year of riding, though, I think my brain is now working automatically in the background to keep the bike up. Before, I think I wouldn’t respond soon enough, especially when I was trying to maneuver the bike and keeping it upright was secondary. I would let it go too far, and then not respond quick enough. This past winter I had it on ice several times and it didn’t go down because I was paying close attention and being very careful. Also, I was getting used to horsing the bike around the yard with no speed to stabilize it. It will be interesting to see if the bike goes down at all from here on out. 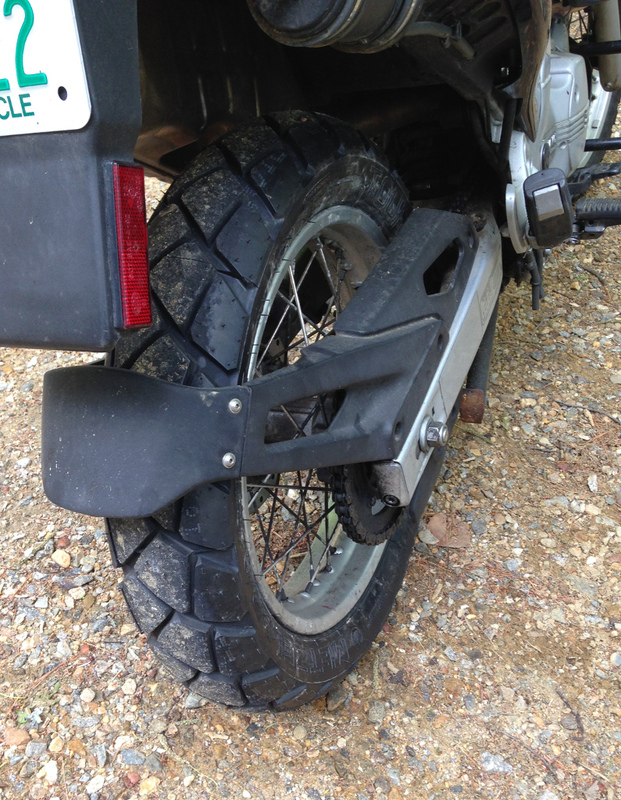 I couldn’t believe how hard and stiff the new, unmounted Metzler Tourance rear tire was. You couldn’t even deflect it. Hard to imagine ever getting it on the rim. Nonetheless, it was warm today (maybe the tire would be softer) so I put the bike up on the center stand right in the shelter so I could throw the tarp over it all in case a thunderstorm blew through, which it did. It’s relatively easy to get the wheel off the bike. Remove the mudguard, the lower chain guard, loosen the chain adjuster screws, support the tire, remove the axle and move the wheel forward to get the chain off it. Roll the tire out and catch the sprocket assembly as the cush drive separates. I popped the bearing seals off and added some new grease. I then used the same technique described for the front tire. I used some 409 to lubricate the tire beads, but I still had to work the levers pretty hard to get the old beads off and the new ones on. One serious obstacle occurred when installing the new tire after I got one bead on the rim and the tube inserted with a little air in it. I couldn’t get the valve stem through the hole in the rim. If I tried to get my fingers in there to guide it, the the bead blocked the hole. So I aligned the valve stem and put a portion of the second bead on the rim in the vicinity of the valve stem so the tube was inside the tire with both beads on the rim. Then…I used the quick clamp with one side of it on the rim and the other on the outside diameter of the tire and squeezed the tire to get the valve stem to move up near the hole. Fortunately I could see it and used a small Allen wrench to guide it into the hole enough to put a retaining nut on it. I forgot to align the red dot on the tire with the valve stem, but when I checked the balance by rocking the wheel and spinning it many times, it seemed to have no particular heavy side. Maybe I just got lucky. So I didn’t add any balancing weights. I also forgot to relube the bearings in the sprocket assembly. It’s like there are two wheels riding on the rear axle, the one with the sprocket on it and the one with the tire on it. The sprocket wheel has several cast knobs on it that mate with the rubber cushion in the tire wheel. At some point I need to take the rear wheel off again to lubricate the swing arm bearings, so I’ll do the sprocket wheel bearings then as well. The bike handles better with the new tire. It is easier to lean over, so it enters a turn quicker. I assume it is because the old tire had worn flat on the bottom. So far I like the set of Metzler Tourances. When I bought the 1997 F650 last year, it had 3800 miles on it. At some point, I realized it had the original Michelin tires on it. Prior to 2000, tire manufacturers used a 3 digit code with the first two digits indicating the week of the year and the last digit being the last digit of the year. My code was 326, meaning the tires were made before 2000, in the 32nd week of either 1996 or 1986. By elimination, the year is 1996. They looked fine with plenty of tread, but on close inspection they were somewhat cracked, like a dry rot on the sidewalls. Still pretty robust and I didn’t have any trouble with them, but it’s obvious I needed new tires. Yesterday, I changed the front tire, tube, and rim band, and refreshed the grease in the wheel bearings. That grease is 18 years old also. The new tire is a Metzler Tourance from the BMW dealership. I have the rear one also, but I haven’t installed it yet. I used the Clymer manual, but I didn’t remove the front brake. I discovered I can carefully get the wheel out with the brake still there. 1. I set the tire down, brake disk side up, on a 5 gallon bucket that I had put some rocks in to stabilize it. 2. I removed the valve stem and let the air out and loosed the retaining nut on the valve stem. 3. 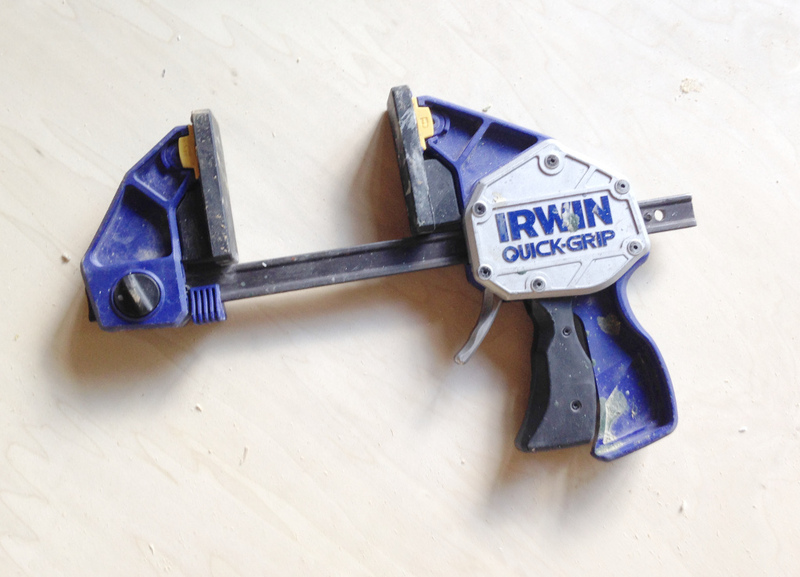 I used a carpentry parallel jaw quick clamp to break the bead. Worked well. 4. About 90 degrees from the valve stem, I placed the Bead Buddy on the upper bead to hold the bead down in the “drop center” of the rim. 5. Across from the Bead Buddy, I used the levers to work the bead up off the rim. Then worked it around until the bead was all outside the rim. 6. I pulled out the tube. 7. I couldn’t flip the wheel on the bucket because the disc is too large, so I stood it up and worked the other bead off the rim the same way. So I now had the rim sitting inside both beads. It’s easy to get the rim out in that scenario. 2.Set the rim on the bucket with the brake disk up. 3.Set the tire on the rim, with the correct rotation, and place the red spot on the tire next to the valve stem. Work the lower bead over the rim with the levers. 4. Put just enough air in the tube to keep it round. Install the tube inside the tire with the valve stem through the hole and the retaining nut loosely threaded on the stem. 5. Lever the top bead onto the rim. Careful not to pinch the tube. The lever hooks onto the rim edge and prevents pinching the tube. I made sure I didn’t stick the lever into the tire interior. 6. Tighten the valve stem nut and add the lock nut on top of it. Inflate the tire to about 30 psi. 1. After removing any existing weights, I inserted the axle through the hub bearings and held the tire by grabbing the ends of the axle. I rocked the axle ends up and down and the heavy part of the wheel gradually crept towards the ground. Did it again with same result. 2. Added a single steel adhesive-backed weight opposite the heavy side. 3. Rechecked balance and it was still heavy in the same place. Added another weight on the opposite side of the rim. 4. Checked the balance and it seemed okay. 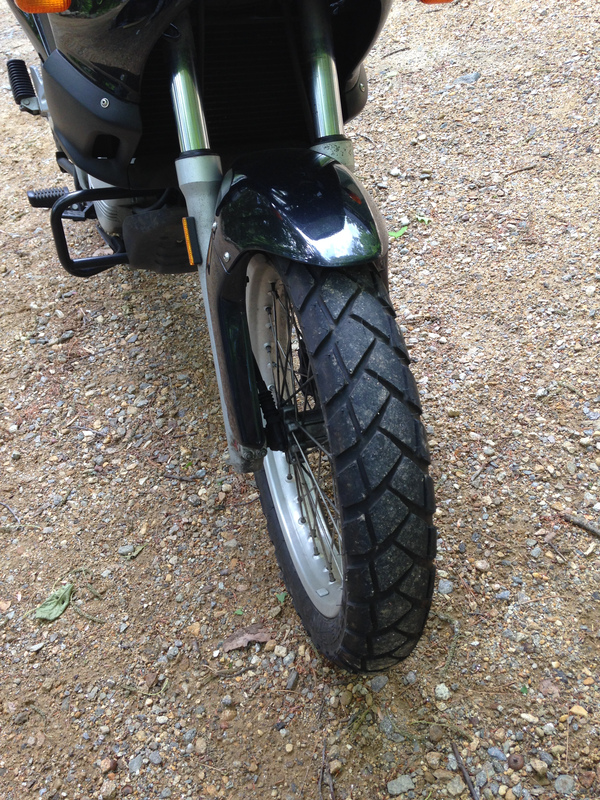 I road tested the new front tire and it seems fine, already feeling better in turns than the old one. Now I’m anxious to get the rear tire on. Last Fall I relubricated my steering head bearings, using the procedure in the Clymer manual, but I had not really been able to get the tightness adjustment right. Occasionally going over bumps I would hear a little play click. Recently I tried again and succeeded in getting it tighter, but then lost it after riding, indicating the lock nut was not doing what it should. Well, the top bar of the triple tree is sandwiched between the bearing adjust nut and the lock nut. The lock nut is what you see exposed just under the handlebars. Even though I had the fork tube clamps loosened on the top triple-tree bar I think the bar would not slide freely as I tightened the lock nut, leaving me with no lock nut action against the adjusting nut. I tightened the slotted adjust nut using the crude but effective light tapping on a screwdriver angled into the slot, so the nut rotates. I tapped on each end of the bar with a block of wood and saw it move on the tubes. You can rock it slightly and make the tube protrusions uneven momentarily, then even them up and you know the bar is not stuck. Then I put quite a bit of torque on the lock nut and got the feeling that it was clamping the bar against the adjusting nut. Now the steering head is tight, maybe slightly over-tight, and I don’t feel any play in it riding over bumps. I marked the adjusting nut orientation to see if it backs off any. What is wrong with me? It took me nearly a year to stumble on the right method for getting on and off the F650. It seems like a little thing, an obvious thing, but apparently not to me. 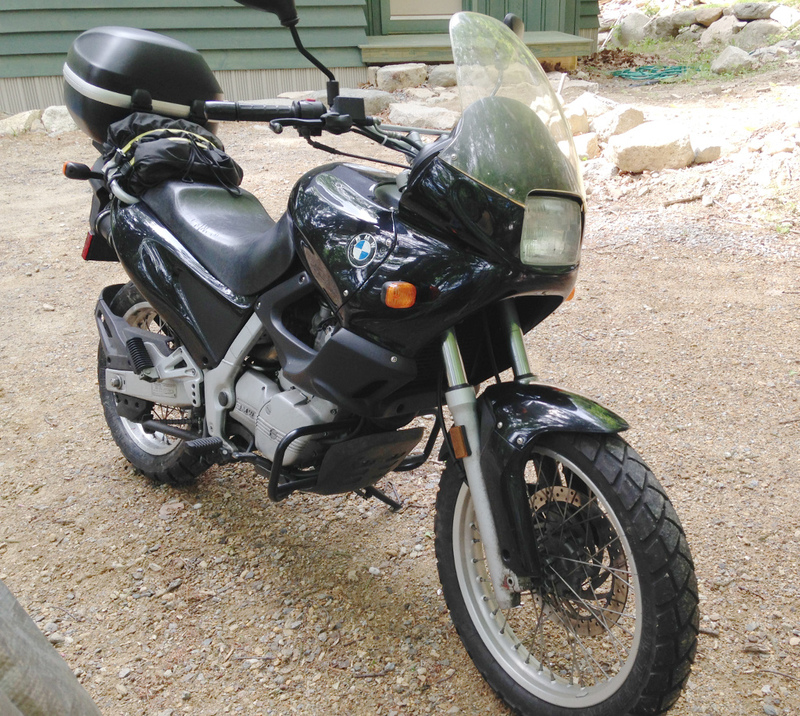 I initially learned to ride it without the top box and I would swing my right leg up over the passenger seat and do the same in reverse when getting off. That was a no-brainer, straight bicycle basics. But then I realized I needed the top box, and I also took to carrying the motorcycle cover strapped onto the passenger seat. I couldn’t get my leg up over those, so I assumed I had to do something else. I tried two methods. The first involved raising my right ankle up to where I could grab it and then helping my right foot over the seat and then somehow getting my knee to follow. Something similar in reverse. The second method was to “goosestep” over the seat getting on, and use method one to get off. These were both awkward. I think I saw Ewan McGregor use something like method two in The Long Way Around with his heavily loaded R1200GS. The correct way for the F650 turns out to be a variant of my initial technique. The trick is to lay your upper body over the handlebars so you are more horizontal, and let your calf flip up into the air at right angles to your thigh. Same in reverse to get off. Very slick. Very easy. Very smooth.